Well I woke up this morning pissed off at all brown trout. I had it on my mind to catch them all by the end of the day to make up for the last couple days. That didn't happen but it was a little better than it had been lately. I had 8 browns at 10 am and still had 8 at 3 pm. I fished every hole on the White River between Wildcat Shoals and the White Hole. Don't think that wasn't a long 5 hrs. I ended the day with a flurry. 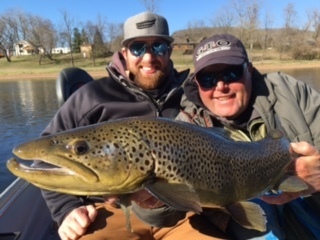 We landed 4 more browns in the last 30 min. One of the last four was a little over 5 pounds not a monster but a heck of a lot better than the 20 inchers I've been catching the last couple days. I fished minnows most of the time today. They seemed to like the skinned minnow better than the rest. The wind was blowing to hard to drift so I anchored. Things got a lot better when I got where I could see em this afternoon. Tomorrows a new day maybe it will be back to normal and I will be able to make it hard on a few brown trout.